Clearly, investors believed the company was on its death bed at that point…but hey, it survived! Why don’t we celebrate by taking a closer look & seeing what NTR might be worth today? Now, first, did I mention: i) NTR’s an Irish grey market share? And ii) it’s rallied over 500% since its 2012 low?! Dear reader, I really do try my best to test you, eh..!? But first, let’s focus on NTR’s intrinsic value per share. Its wind farms are just 2.7 years old (on average), and wind turbines generally have an estimated 25 year+ life. Couple this with wind project financing which depends on debt amortisation & back-ended returns for the ultimate equity owners, and it means we can’t rely on current return on equity (or P&L/cash flow run-rates) to accurately determine fair value. We shall focus on a Balance Sheet/SoTP analysis instead. But then she warns us: ‘The chart…provides a snapshot view of the components of our total net assets. It should be noted that it is based on book values only and does not represent the strategic value of the assets or what might be achieved were a market based valuation completed’. And perhaps it throws a different light on the EUR 100 million share redemption last November. Obviously, all shareholders benefited equally – but we can be sure the EUR 40 million received by Roche & family must have been a welcome bonus at the time! But in the end, reports of these debt dramas mean little in relation to my valuation approach – I’d prefer to construct my own balance sheet valuations anyway. But they obviously provide useful context and perspective for current & potential investors to consider, when evaluating NTR’s management & business. Scenarios I & II: Zero. 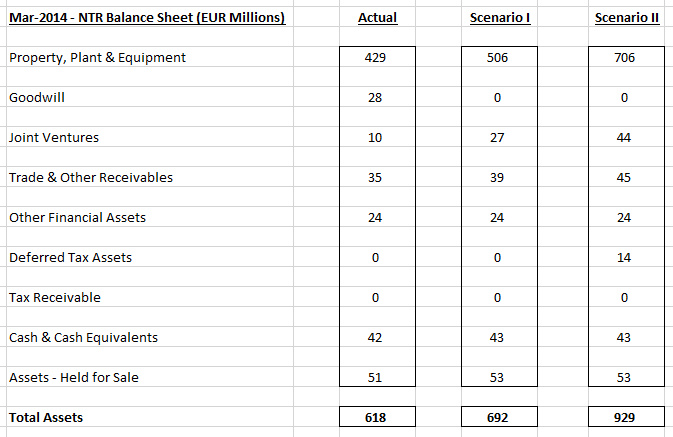 Scenarios I & II: Note the net €41 M of assets & liabilities held for sale appears broadly equivalent to the announced $60 M Osage deal price (on a PV basis). Scenarios I & II: Risk this grant liability will ever be crystallised/repayable is remote, and legal liability will be extinguished in 2015 anyway. Zero. Scenario II: Noting the substantial release of prior accruals/provisions in the past couple of years, assume this remaining provision will be reversed, or offset elsewhere. Zero. And wow…just to remind you, the NTR share price last traded at EUR 1.57!? Of course, we must acknowledge the gap between a company’s share price and its intrinsic value can sometimes be a long & difficult journey… But in terms of a key event/catalyst, this Sunday Times story (from March) is critical: ‘Tom Roche, the largest shareholder in NTR, has wrested back control of his 38% stake in the investment firm after a receiver was appointed to the company that holds the stock…It is understood Roche had been seeking a substantial discount on the borrowings guaranteed by shares in NTR...Roche, who is the chairman of NTR, won a last-minute reprieve by writing a cheque for the full amount of the loans last Monday’. A bizarre story indeed, but it wraps up the last of NTR’s debt ‘issues’…and we’re already seeing better market sentiment, and a renewed investor relations effort & much-improved results from the company ever since. NTR delivered its first net profit since 2008, it also indicated continued profitability for the current year, the share price is trading near a 4 year high, the construction-phase 150 MW Osage wind project was sold for USD 60 million post year-end, the annual report was accompanied by a new Shareholders Communications Policy & a useful Explanatory Guide, while Rosheen McGuckian (the CEO) has been out courting the press & talking about NTR’s new expansion plans. More importantly, my favourite catalyst is also present: Activist investors! Pageant Holdings should be familiar to readers – in May, I highlighted some of their disclosed holdings, which clearly demonstrate ‘a keen eye for value’. But their 29% stake & involvement with Zamano (ZMNO:ID) also highlights they’re prepared to be far more than a passive value investor, if necessary. As of last month, their stake in NTR has steadily increased to 9.1% (from 7.0% a year ago), and it’s now their largest publicly disclosed holding with a value of EUR 14 million. Pageant ‘recently indicated it was in favour of NTR selling its valuable wind asset in America, Wind Capital Group, effectively meaning a break up of the group’. And back in March, Nick Furlong confirmed he was an ‘avid’ buyer & also ‘said the NTR stock was worth more than EUR 3.00’. Knowing Furlong’s only quoted in the press once or twice a year at most, I certainly wouldn’t treat this as merely some off-the-cuff remark… Of course, it’s also nice confirmation of my own fair value estimate(s)! One Fifty One plc (One51 – incidentally, another Irish grey market share) is a much larger shareholder. This is an investment Alan Walsh inherited when he became One51 CEO in 2011, and he’s been an NTR board member since Jun-2012. CNBC may focus on Ackman & Icahn, but corporate CEOs are the unsung heroes of activist investing. Activism isn’t a portfolio decision for them, it’s a key one-time event to maximise & extract value. And inevitably, they’re on the board – so they know the players & the history, they know where the bodies are buried, and they know the right levers to pull. Most of all, they have a burning desire to extract cash & re-invest in their own business. So forget Icahn – a corporate CEO seeking to realise a substantial stake in another company is far more relentless..! Meanwhile, One51 just completed the acquisition of Straight plc (STT:LN), and is now proposing a new private fund-raising, which certainly confirms they see plenty of expansion potential in their existing core businesses. Oh, and I shouldn’t forget, Pageant also has a 7.9% stake in One51 (this article suggests they’ve now reached 12%)! Which means I’m quite happy making a colossal mental leap here & presuming they’re both pretty closely aligned regarding NTR…in spirit, if not in deed. But first, NTR has to arrive at a decision to sell its US wind assets. The annual report’s no help – management’s clearly unenthusiastic about new US wind projects, but remains strangely silent about potentially realising value from its existing Lost Creek & Post Rock wind farms. Ultimately, I think it’s going to be an unavoidable decision to consider. Because once a wind farm’s up & running, there’s precious little you can do to enhance its value. All you need is a redneck, his tools & a pick-up truck, plus a very long ladder…so he can check everything’s running smoothly. He can mow the grass, plant some flowers, paint the Stars & Stripes on every turbine, it makes no difference. You can buy a tanker of WD-40 & tell him to go hog wild, you can even try persuade him to spend all that spare time doing an MBA, it still makes no difference..! But this is a good thing – that kind of dependability is an obvious reason why wind farms are so attractive to income investors. They produce predictable long-term revenues (from 20 year PPAs), with minimal capex & operating expense – after debt interest & amortisation (and the debt can be re-financed in due course), investors can enjoy increasing cash flows & dividends for decades to come. And these days, US investors are totally ravenous for yield, which explains the huge boom in US REITs, MLPs & now Yieldcos, and the escalating prices/multiples they’ve been willing to pay for long-term assets & infrastructure. And really, what’s the alternative here?! Ask shareholders to hang on for the next 20-30 years, while value is harvested in small annual increments? And hope an unlisted Irish company, which owns US wind farm assets – a strange beast, indeed – will suddenly revalue & achieve the kind of valuation we might expect up-front from an open-market auction? When we’re surely near the end of a decades-long bond bull market (2.38% on 10 year USTs & 0.98% on Bunds)!? NTR now has a golden opportunity to realise a premium valuation from a successful investment…and considering its fiduciary duty to shareholders, I suspect the board will ultimately arrive at the same conclusion. But then there’s another decision for the board to make – to distribute or re-invest the proceeds? But that presents the same issues… To explain: Essentially, these wind assets now represent NTR’s net worth – so if they were realised, I’d hope to see NTR’s market cap gravitate to the value of its resulting cash pile. But if cash ends up being re-deployed into a new long-term European wind strategy, as management’s now proposing, could we expect asset values to be correctly reflected in an unlisted Irish company’s market cap? Or would shareholders just end up trapped in a neglected & under-valued company? [And look at deficits, debt & future entitlements across Europe (or the US) – is management so confident governments will be in a position to continue providing the necessary subsidisation of wind farm projects? I’m not so sure I’d make that bet…] In the current environment, a UK/Irish market listing might achieve an incremental uplift in valuation, but it still wouldn’t solve the basic problem – the natural home, and the highest valuation, for NTR’s wind assets is in a (US-listed) income-oriented fund (or a private equity/pension fund). Ultimately, I try to buy the business, not the stock – my last post covers this exact ground. NTR has no debt (at the holding company level), there’s plenty of publicly reported transactions to quickly & independently benchmark the value of its wind farm assets, and I believe we’re in an exceptional environment to achieve a quick sale of those assets. Best of all, shareholders can leave all the heavy lifting to Pageant Holdings, and particularly to One51 – in terms of their activism & its potential results. All of which offers a free option & a good night’s sleep! 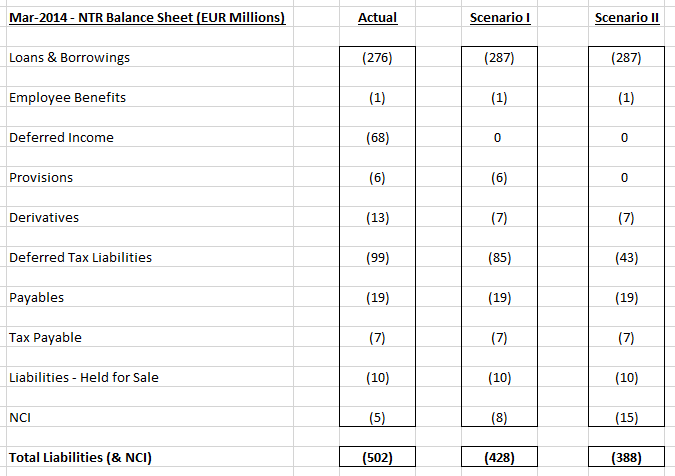 In my opinion, Scenarios I & II (above) mark out a realistic range of underlying intrinsic values for NTR. [If you prefer to focus/rely on book value, the shares are now trading at a 33% premium – not excessive for a profitable company, presuming you agree the balance sheet’s conservative]. Assuming a potential revaluation and/or realisation anywhere within this range would obviously offer very decent upside. Personally, I’m happy to rely on the average of my Scenarios as a good indicator of NTR’s underlying intrinsic value – that’s a EUR 4.08 Fair Value per share, which offers an Upside Potential of 160%. I currently have a 6.8% portfolio allocation to NTR plc. The forthcoming AGM is being held at the Conrad (in Dublin), on September 4th – it will be interesting to see if there’s any fireworks at the meeting. If you’re already a shareholder, why not come along & create some fireworks of your own..?! Amazing hw impatient investors are…avg investment time horizon nw seems to be abt 3-4 mths!? + iii) sale process was launched (w/ Marathon Capital), and iv) a decent set of interim results…yet NTR shrs hv retraced 19% since Sep!? You need to get a better understanding of the PTC accounting treatment and the flip structures in the US before assuming valuations, the only way to value is on a DCF. You should also note that YeildCo’s use the ITC tax structure to enable distribution of the free cash flow. More relevant metric for you analysis may be the development premium in the US is circa $100-150k/Mw, in Ireland you looking at €300k/Mw+! NTR opted for PTC on one farm & the ITC on the other. Obviously any potential buyers will value & bid based on a DCF analysis. I’d love to do the same here, but of course we don’t have the necessary detail from management – that’s why I highlighted above: ‘we can’t rely on current return on equity (or P&L/cash flow run-rates) to accurately determine fair value’. Every project’s a little different, of course, but based on the history of the projects & the info. provided at the time/to date by the company, I’ve seen no suggestion at all here that project structures & financing are somehow out of the ordinary (or adverse to NTR’s shareholders). In terms of original project costs, as well as sector costs & reported deal values, I believe $2.0 million per MW (as above) represents a very reasonable floor for potential bids in a competitive auction situation. I don’t think DCF is the only way you can value these assets and it is certainly not the only metric that investors/buyers use to value these assets! There are many ways to value assets like Wind Capital Group. DCF is particularly good for valuing wind farms that have already paid off the tax equity investor and bank debt. A combination of DCF analysis, EV/EBITDA multiples, EV/MW and of course ‘replacement cost’ should give a good indication of fair value. I believe that NTR will sell WCG for a number larger than $800mm. ntrplc.com/uploads/documents/shareholder_services/Notice_of_AGM_2014.pdf … NTR’s AGM this Thursday may prove to hv more fireworks thn I originally expected..! It seems entirely reasonable shareholders should have an actual opportunity to consider & approve a specific use of proceeds for a proposed (substantial) share issue, rather than giving management carte blanche in advance to raise & spend money as they see fit. This is even more critical when a company’s already cash/asset rich – which begs the question, why would a fund-raising be needed? [Not to mention where a company’s shares are trading at a substantial discount – a new issue of shares would dilute fair value per share]. The last resolution is just as objectionable – why should shareholders vote to dis-enfranchise themselves?! The right to participate in a company’s rights issue is clearly valuable to all shareholders! And the desire of companies to deny/exclude small shareholders (for reasons of convenience & economy) seems counter-productive to me anyway – they’re often the most loyal of shareholders, and should be accommodated/rewarded accordingly. How do you track activists’ stakes in Irish/English/European companies? And a company’s IR section of their website is also a good place to consult – ideally, they’ll have an up-to-date listing of major shareholders. For European companies, this might be your best bet – otherwise, you may have to track down a company’s filings on the relevant stock exchange website(s), and they may not be in English. Since NTR’s unlisted, the annual report (see the director’s report – e.g Page 19 here: http://www.ntrplc.com/uploads/documents/shareholder_services/NTR_plc_Annual_Report_2014.pdf) provides the latest snap-shot of the major shareholders. [Unless NTR, or a shareholder, chooses to subsequently notify a substantial change in shareholding(s)].